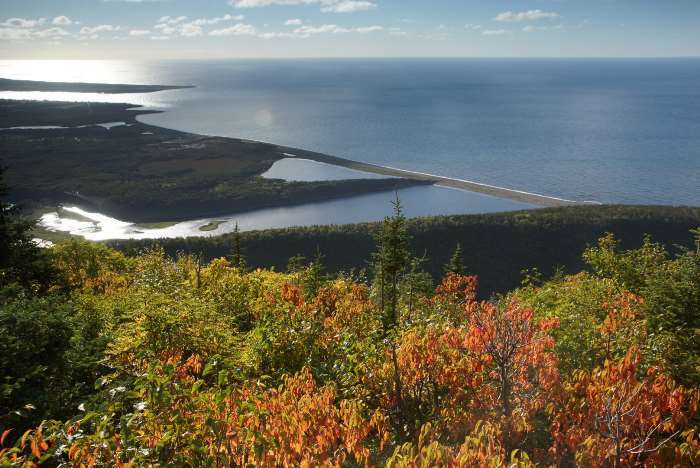 You’ll find one of Cape Breton’s nicest hiking trails on the east side of the park, just beyond the entrance from the town of Chéticamp. 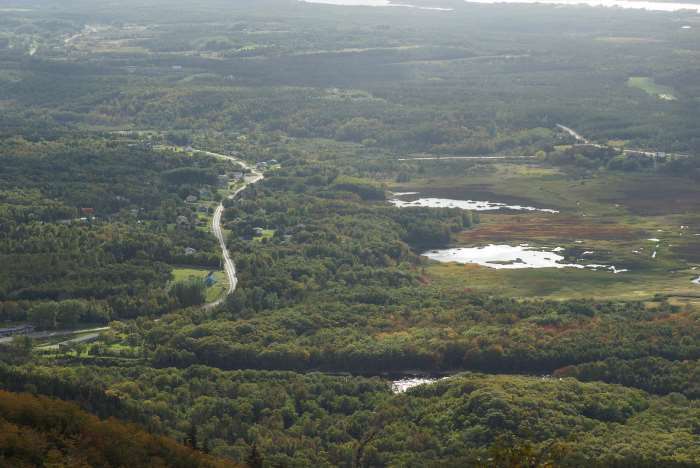 The Acadian Trail is a 5.2 mile (8.4 kilometer) loop that leads to some great viewpoints. You could make it a bit shorter by avoiding the backside of the loop. 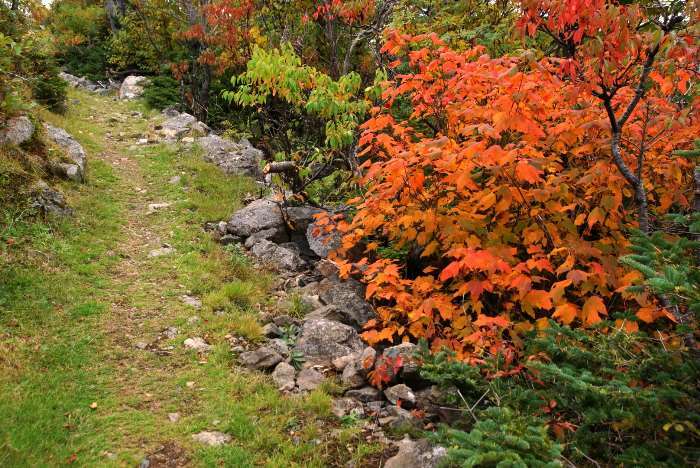 In early October, you should see some nice fall colors along this trail. 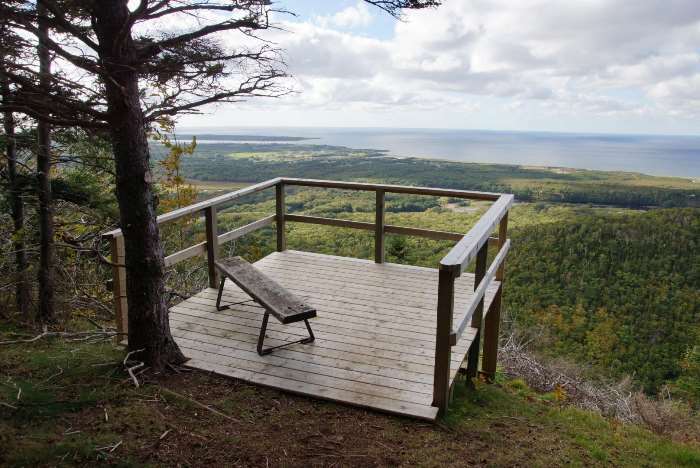 To access the Acadian trail, park at the Chéticamp Visitor Center, just inside Cape Breton National Park. 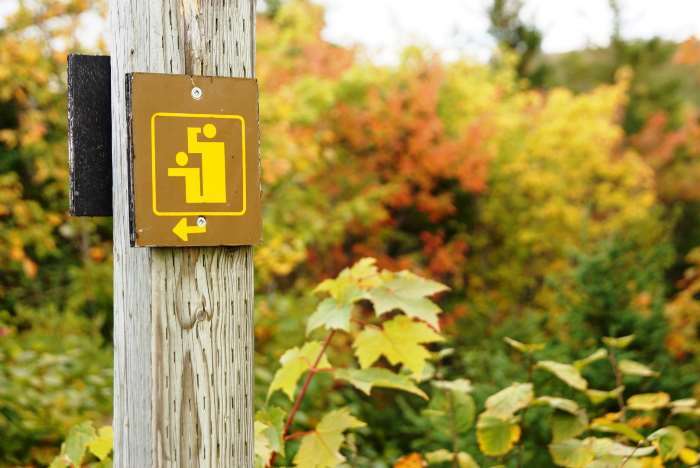 The trailhead is located across the driveway from the visitor center. 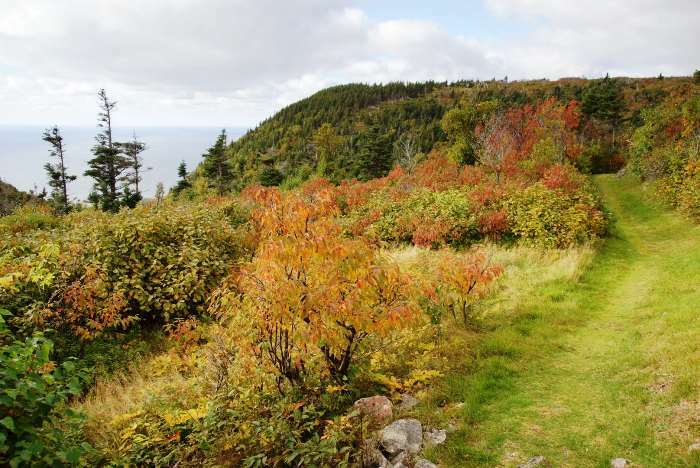 The Acadian Trail was my third hike of the day, and I didn’t arrive until the middle of the afternoon. I knew I was pushing it, but the trail was highly recommended by my B&B host, so I wanted to give it a try. The trail is a steady climb uphill. 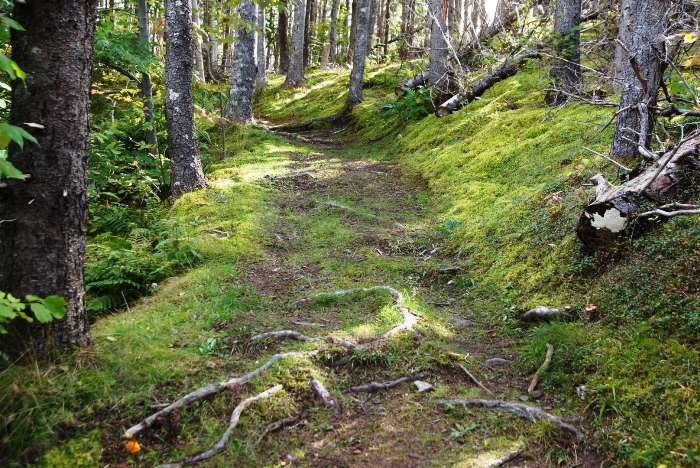 You won’t see much at first, aside from a beautiful, mossy forest. … that gives you a preview of what’s waiting up ahead. 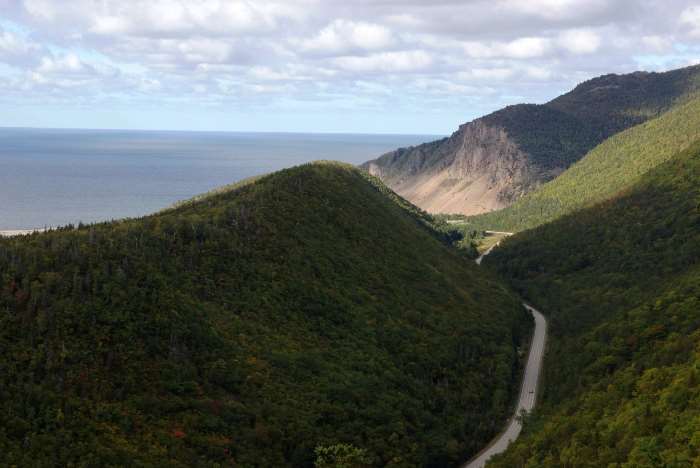 That’s the Cabot Trail down below, looking north along the coast. 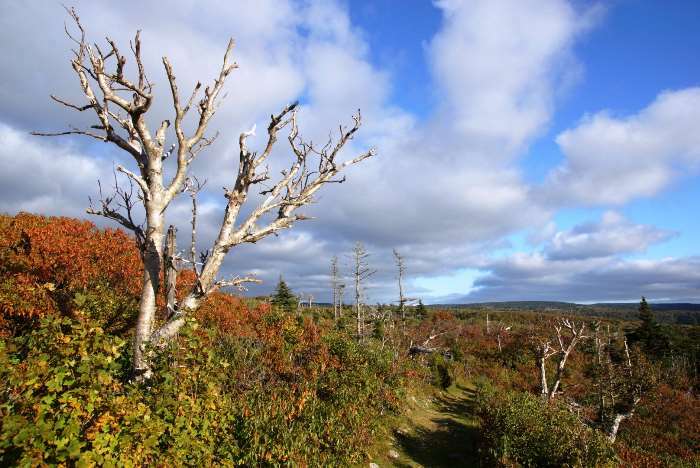 There wasn’t a lot of color on the trees down at sea level, but the color improved, the higher I went. 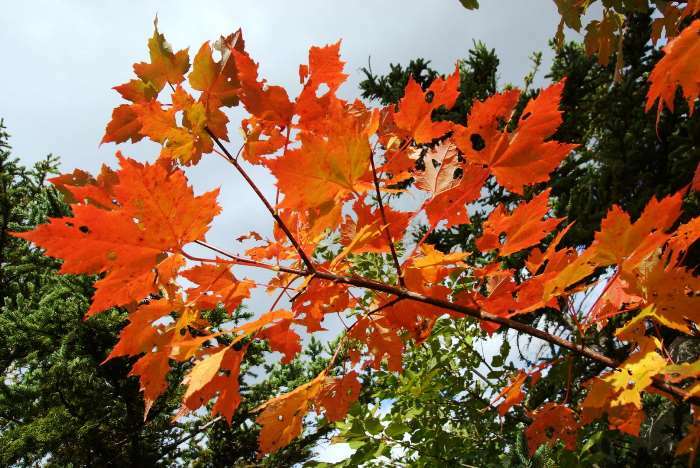 … and occasionally I’d run into a tree that was in full fall color. After that first viewpoint, there weren’t any good views for a while. 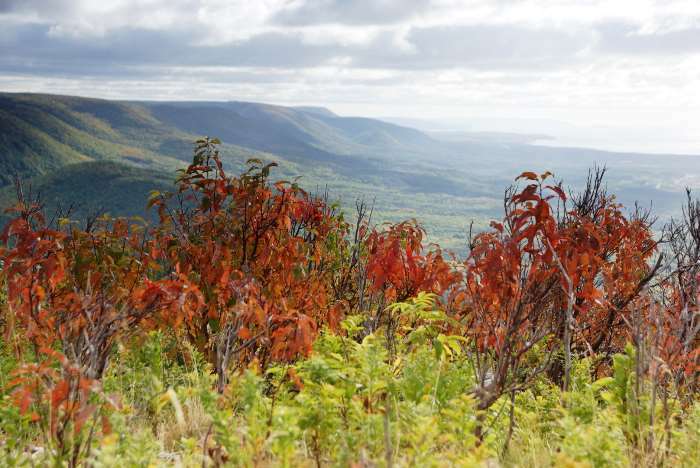 … including a look at the town of Chéticamp. … led to another viewpoint. Despite offering some benches, this view wasn’t terribly exciting. The final viewpoint is the best. It’s a short distance off the main trail. This is where you’ll find one of the park’s red chairs. When I arrived, I was the only one there, so I plopped into the chair and took it all in for a few minutes. 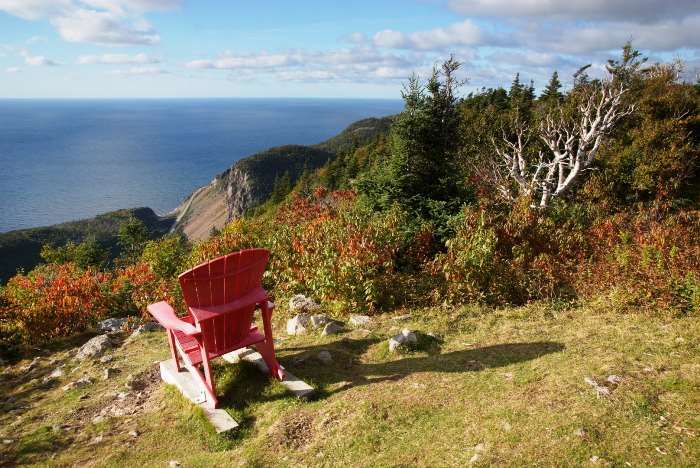 From the red chair, the view towards Chéticamp to the south is fantastic. Looking north is quite nice, as well. 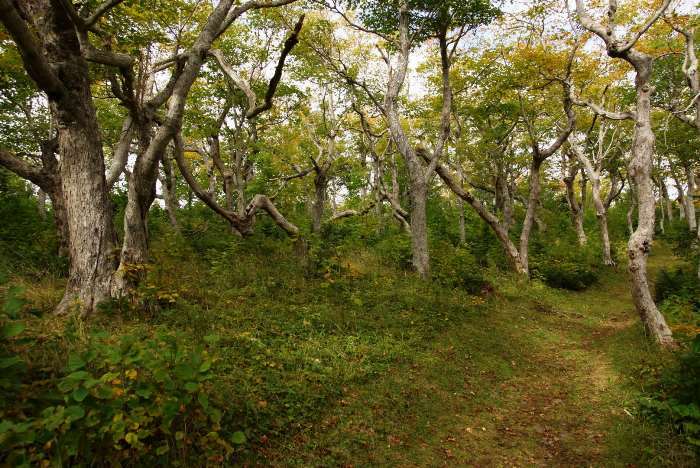 This part of the trail is mostly wide-open, with just a few stunted trees scattered about. Because it was getting late, I decided not to hike the back side of the loop. 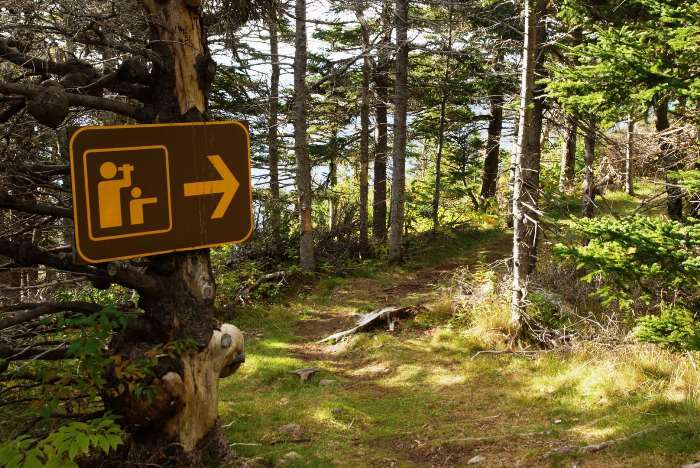 According to the map, there was just one more overlook on that part of the trail, and then the path dropped down into a valley, following a creek, as it completed the loop. It might have been a very pretty hike, but that valley would have already been too dark to enjoy it. 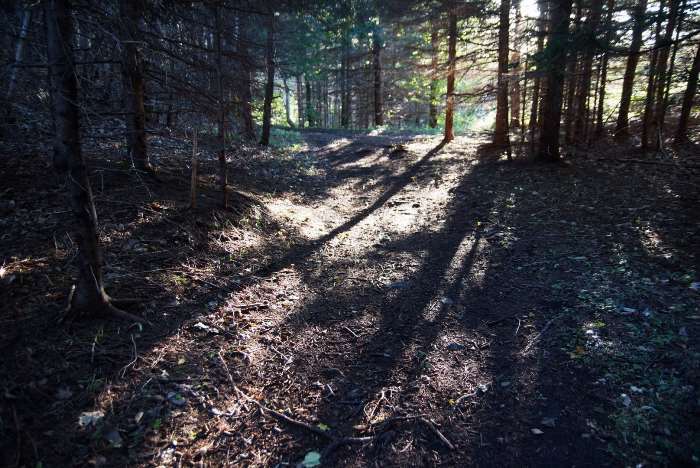 So, I headed back down the way I came, stopping at just one spot to capture the sunlight streaming through the trees. 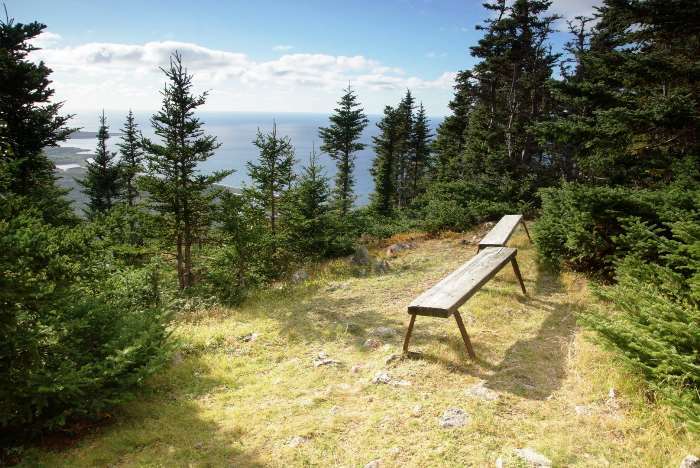 If you don’t mind a moderate uphill climb (the trail gains about 1,100 feet of elevation), you’ll enjoy the great views on the Acadian Trail. It took me about 1:40 to get from the parking area to the red chair — probably a distance of about 2 miles one-way. 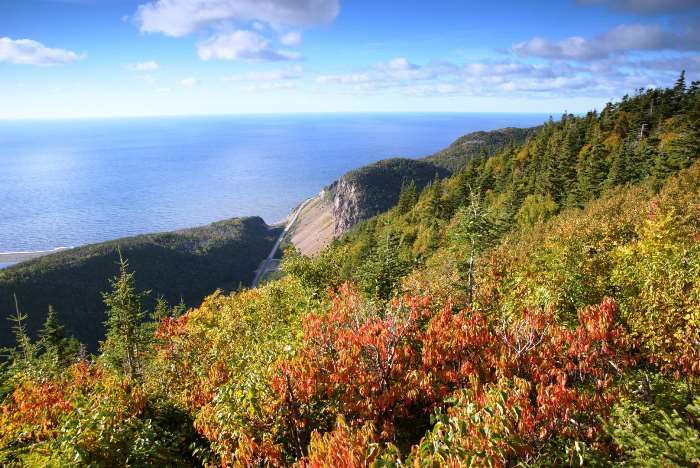 If you’re visiting in late September or early October, and you’re having trouble finding fall colors at sea level, you may have better luck at a higher elevation, near the viewpoints in the stunted-growth forest.